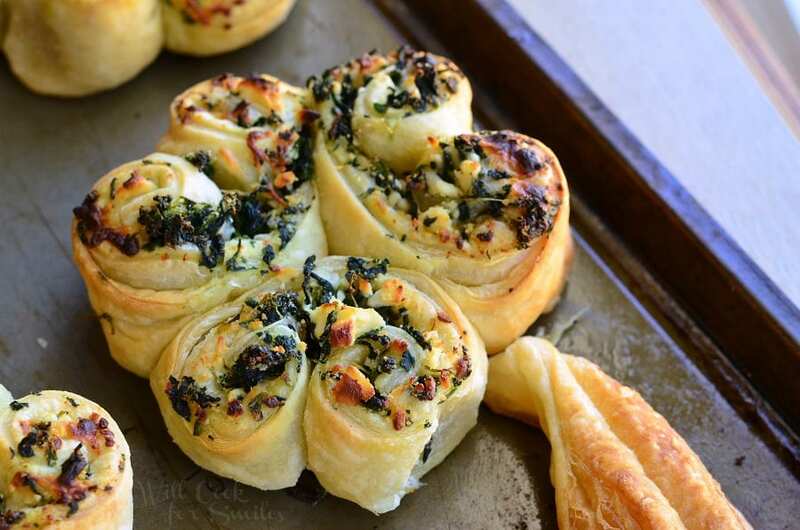 This is not just an adorable shamrock snack, it’s a delicious pastry rolled with spinach, feta and mozzarella filling. Fun, green snack for St. Patrick’s day or any other time. I had an adorable little idea bug strike me with a green St. Paddy’s Day idea last week. 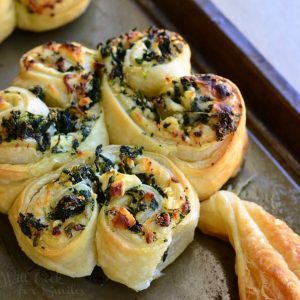 I was thinking about the kind of green treats I can make without using food coloring and I thought that spinach pastry would be a perfect treats. Almost every time I go to Whole Foods for coffee, I get a spinach pastry from their bakery section. Yes, I go to Whole Foods just for coffee at least once a week. I don’t know if it’s every store, but my store had the best coffee shop inside. They don’t just have a delicious cold drip that will put quite a bit of hair on your chest, they also make wonderful espresso beverages. My favorite part is that my cappuccino comes with 2 more shots than in the other famous coffee places, baristas put so much love into each drink, AND it’s much cheaper. I just can’t resist it. And even though I spend my morning in another coffee shop, working, where I love all the people that work there, their coffee is just not quite as loaded with espresso shots and love as I need it most mornings. So back to the pastry. 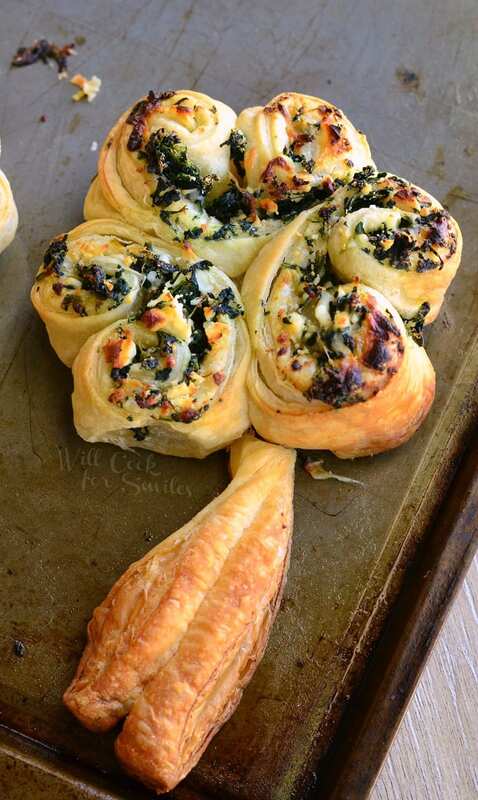 Spinach pastry would make an awesome green snack. Shaping it into a shamrock is just a fun touch. You can also keep the “shamrock leaves” separated and you will have a bunch of little pastry hearts. 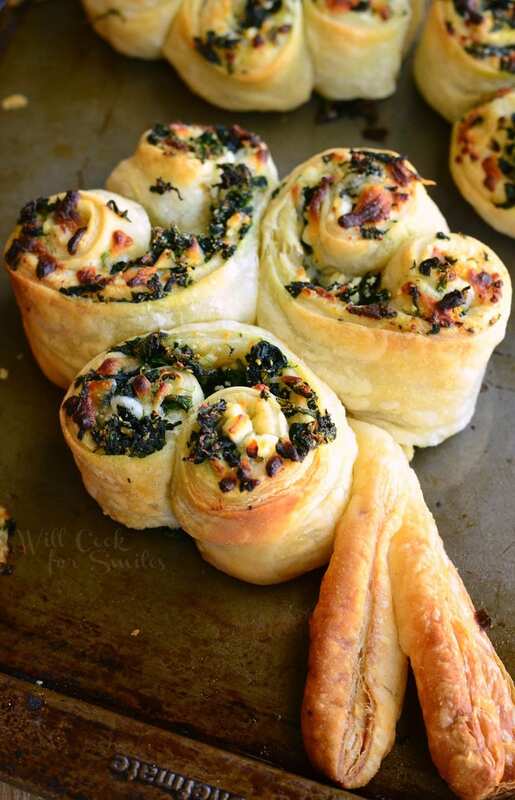 Fun and easy way to get your spinach fix and celebrate St. Paddy’s day. 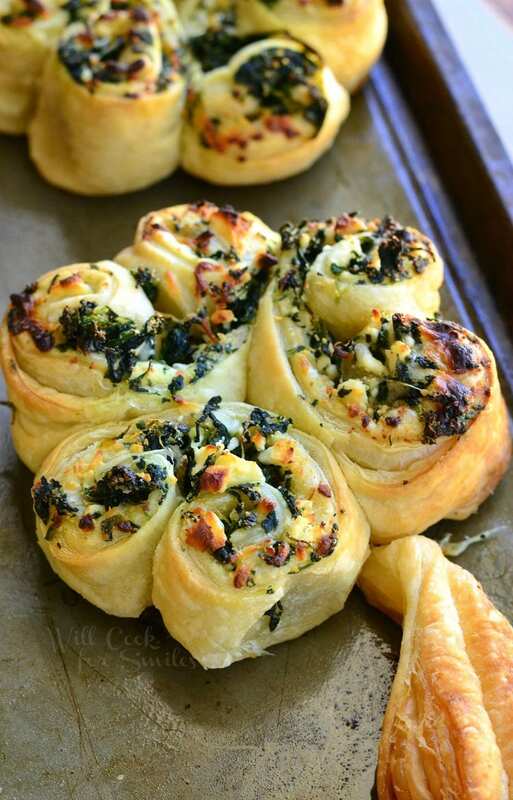 This is not just an adorable shamrock snack, it's a delicious pastry rolled with spinach, feta and mozzarella filling. Preheat oven to 400 and grease a baking sheet. Melt butter and set close by in a cup. You will also need a brush. Squeeze defrosted spinach well and dice to get rid of long strings. In a medium bowl, combine spinach, feta cheese, mozzarella cheese, salt and pepper. Mix well until thoroughly combined. Lay pastry sheet squares on a cutting board. Brush them with butter. Optional: Cut off a 1/4 inch slice off of each pastry square to make stems for shamrocks. Divide spinach/feta filling between the two pastry squares and spread it evenly all over the square. Using a knife or a pizza cutter, cut pastry squares into long strips that are about an inch to inch and a half wide. Starting with each opposite end, roll both ends of the strip towards its center. Lay it on it's side and gently form a heart by softly pressing the sides. Repeat with two more strips and lay the hearts on the baking sheet, ends together, to form a shamrock. Brush pastry with butter on all the sides, especially in between each pastry, butter will work like glue. Repeat with remaining pastry strips. You should be able to get 3-4 shamrocks, depending on how wide you will cut the strips. You can make stems by placing the thin strips that you cut off together into one long strip and cutting it in 3. Then fold each smaller strip in half and tuck it under each shamrock on the baking sheet. Bake for 20-23 minutes, until pastry is golden brown and puffed even in the center. gorgeous, fun, clever, and delicious!